Obtain the geographic location and orientation of a device. Core Location provides services for determining a device’s geographic location, altitude, orientation, or position relative to a nearby iBeacon. The framework uses all available onboard hardware, including Wi-Fi, GPS, Bluetooth, magnetometer, barometer, and cellular hardware to gather data. The first time that your app requests authorization, its authorization status is indeterminate and the system prompts the user to grant or deny the request (as shown in Figure 1). The system records the user's response and does not display this panel upon subsequent requests. After requesting permission and determining whether services are available, you start most services using the CLLocationManager object and receive the results in your associated delegate object. 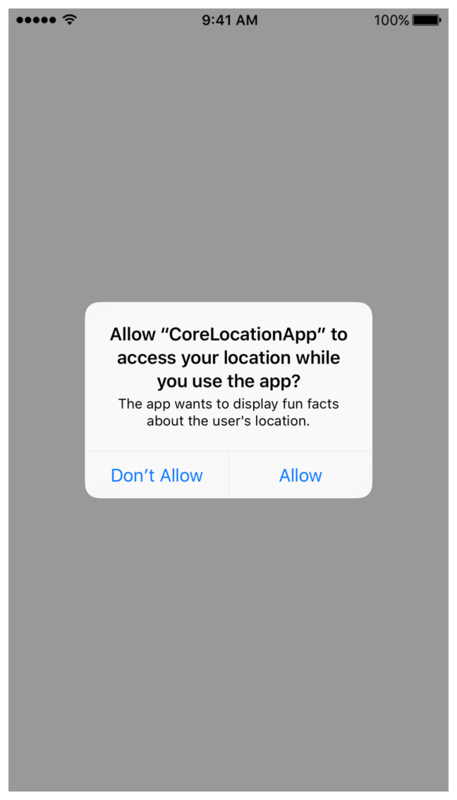 Before gathering location data, you must ask for permission to use location services and determine the availability of those services on the current device. Learn how to receive location data in your app. The latitude, longitude, and course information reported by the system. The latitude and longitude associated with a location, specified using the WGS 84 reference frame. The floor of a building on which the user's device is located. Information about the user's location during a specific period of time. Configure geofences and receive notifications when the user's device crosses the fence's boundaries. Learn how to detect beacons and determine the relative distance to them. Learn how to broadcast iBeacon signals from an iOS device. Information about a detected iBeacon and the relative distance to it. A region used to detect iBeacon hardware. Determine the device's orientation relative to magnetic or true north. Error codes returned by the location manager object. A key in the user information dictionary of an error relating to a delayed region monitoring response. The domain for Core Location errors.